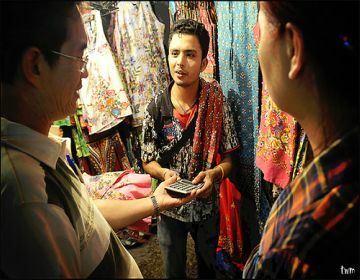 Is it fair to haggle in a developing country when your flight there cost more than ten years worth of the seller’s wages? The fine art of bargaining has been around probably since the dawn of time. But I gotta admit, I still hate it. Jeremy Kressmann over at Gadling recently posted a piece on negotiating anything from a souvenir to hotel to cocktails (I’m assuming) in Southeast Asia. In South by Southeast: Ugly bargaining, he notes five ways to make hustling less of a hustle, and essentially work it out in the best possible manner for both sides. Sure, you might be saving a few bucks, but the gap between your income and the average merchant in Southeast Asia is huge. A week’s wages for you could be more than they earn in an entire year. In other words, I often wonder if it is ethical to bargain – even though it is a part of the culture you are visiting – when the playing fields are so vastly different? I completely understand that starting prices in markets throughout the world are exorbitant, and have an added “tourist tax”. I also get that to buy everything at that asking price could easily eliminate a person’s travel budget and possibly the ability to continue the trip. Still, how much did your flight cost to get you there? And how much did you spend on that new iPod to have plenty of music to listen to on your trip? What about that brand new backpack? Ok, you get my point. Life is the biggest trip of all, and that’s why I’m a budget traveler at all times, not just while on the road. Being frugal at home means I can avoid being cheap while traveling. Maybe we should start a haggle revolution in the West? Do you think bargaining is ethical? Share your thoughts below.